Switzerland - IOM reports that 345,440 migrants and refugees entered Europe by sea in 2016 through 20 November, arriving mostly in Greece and Italy. 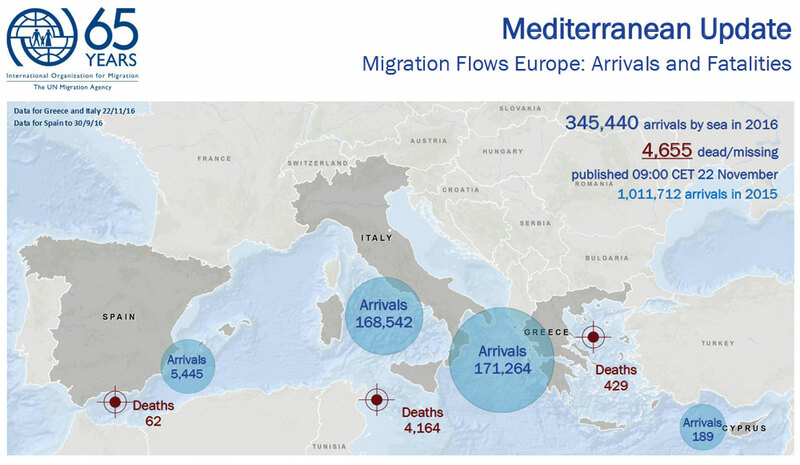 Some 171,264 people have arrived in Greece and 168,542 in Italy during 2016. The total is well below the number of arrivals at this point in 2015, by which time some 883,393 migrants and refugees had made the journey. An estimated 4,655 people have died trying to make the crossing in 2016, compared to a total of 3,557 through this date in November 2015. That is slightly less than 1,100 additional sea deaths in 2016 – despite a migrant and refugee flow that is well under half 2015’s total. The Central Mediterranean route connecting North Africa – particularly Libya – to Italy has proved the deadliest passage, accounting for over 4,100 of this year’s drownings, or roughly 90 percent of the Mediterranean deaths. In 2015 this route accounted for around 80 percent of all fatalities. IOM Rome’s Flavio Di Giacomo reported Monday that up-to-date Italian Ministry of Interior (MoI) figures indicate that some 168,542 migrants arrived in Italy by sea this year as of 16 November. That is an increase of over 17 percent compared with last year during the same period, when arrivals totalled 143,705. MoI officials this week also released data on the top ten nationalities of migrants and refugees arriving by sea in 2016. The largest number – 33,806 – came from Nigeria, a number nearly double the 19,576 arriving by this route in 2015. On the other hand, at least two large “sender” countries in the Horn of Africa – Eritrea and Somalia – show significant drops compared to 2015. Through October 2016, 19,288 Eritreans have arrived in Italy by sea, compared with 37,796 through October 2015. Somali arrivals dropped to 6,698 from 11,020 during the same period last year. Several other West African nations – in addition to Nigeria – also recorded an increase in numbers compared with last year. Migrants from Guinea to Italy increased through the first 10 months of 2016 to 11,131 – compared with 1,916 last year – a nearly six-fold gain. Ivorians also more than tripled, to 10,502 from 3,023. Ghana, Bangladesh, Mali and the Gambia also registered sharp gains. Sudanese traffic was almost the same as last year: from 8,692 during the first 10 months of 2015 to 9,033 during the same period in 2016.